Stylish Laguiole flatware from France. 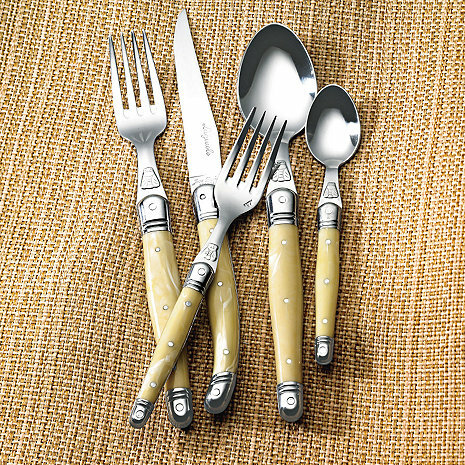 Stainless steel construction and lasting ABS pearlized ivory handles, this fine 5-piece Laguiole flatware set comes from a 200 year old family owned factory in France. Embossed with the traditional Laguiole Bee sign of authenticity. Stylish Laguiole flatware from France. Stainless steel construction and lasting ABS pearlized ivory handles, this fine 5-piece Laguiole flatware set comes from a 200 year old family owned factory in France. Embossed with the traditional Laguiole Bee sign of authenticity. Dishwasher safe. Note: Pearlized Ivory and Ivory are not the same color. Laguiole flatware by Jean Dubost is produced in various weights 15/10, 18/10 & 25/10. The set offered by Wine Enthusiast, is probably the lowest in weight. I own 4 (5pc) settings of the Laguiole Jean Dubost flatware in ivory purchased from another pricier vendor, hoping to add more to my collection with this bargain found. I was severely disappointed upon receiving my shipment. The weight and craftmanship difference between sets are SO evident. I would never be able to combine the two on an evening I am entertaining. I'm returning....here I thought I could give myself a pat on the back for a bargain found. I am a huge fan of the south of France and always enjoyed using Laguiole cutlery there. Purchasing the individual place settings provides the added benefit of getting the salad fork. Not all boxed sets have this item and I have never seen it open stock. Laguiole makes different weight products. This is not the heaviest weight so, if that is what you are looking for, you should be purchasing this product elsewhere. You will see a significant difference in cost between the medium weight and the heavy weight which I thought unnecessary for daily use. I examined each piece and there were no rough edges or other flaws. Unlike some Laguiole, this set is dishwasher safe. The knife is really distinctive. The teaspoon size might startle many Americans since it is smaller than what we are used to. The soupspoon can easily be substituted if your meal requires a spoon for something other than stirring your tea or coffee. I match this with a lovely set of Villeroy & Boch French Garden plates. Many compliments. We had this flatware that came from [...]. We bought additional settings here because of the better price but when they arrived we found them to be inferior quality. They were much lighter weight and the stainless was thinner than the set we had. It was not at all what we expected and we sent it back. It looks like a cheaper imitation. This is very good set everyday flatware. It's stylish and easy to clean...keeps that "new look" a long time! Though it is not as heavy or substantial as the more expensive DuBost Laguoile, for the money..... it's great! Very functional product, fun to use, attractive. This is not quality cutlery. We returned it.